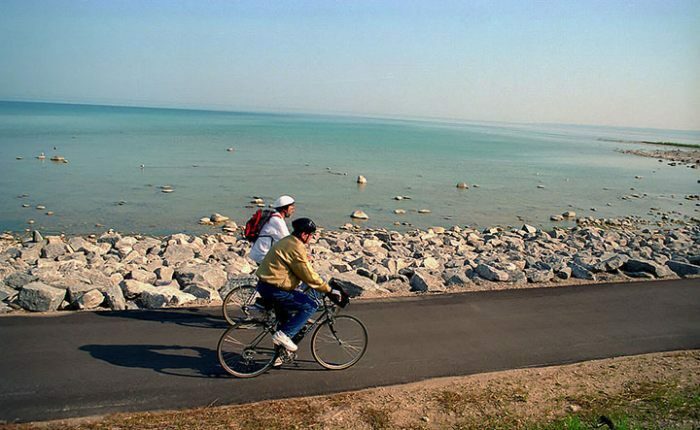 One of the most beautiful paved paths in Michigan, the 23-mile Little Traverse Wheelway provides cyclists, inline skaters, walkers and joggers with a smooth path, incredible scenery and a non-motorized link between three of the most popular resort towns in northern Michigan; Charlevoix, Petoskey and Harbor Springs. Much of the trail skirts Little Traverse Bay, featuring open views of the water. 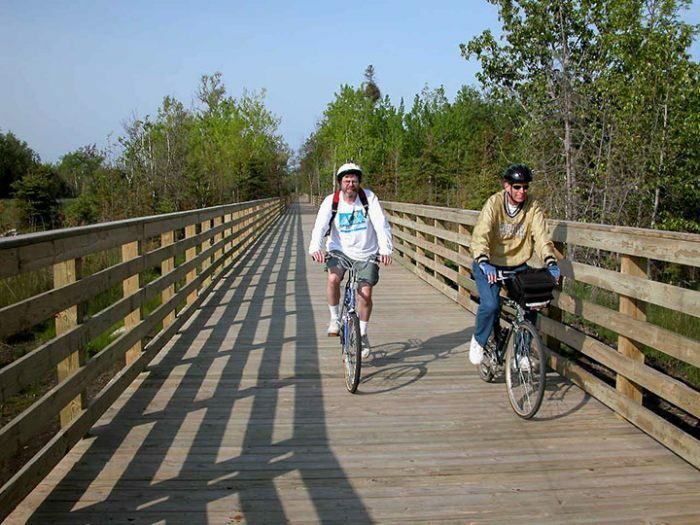 Just north of Charlevoix is a half mile stretch of boardwalk through an intriguing wetland while the path between Petoskey's Bayfront Park to Petoskey State Park follows the original Little Traverse Wheelway dating back to the 1880s. A gate over the trail at the east end of Bayfront Park replicates the original gate that stood at nearly the same spot. The current Wheelway dates back to the mid-1970s when the Little Traverse Kiwanis Club was searching for a community project. At first there was little show for the work and fund-raising by local groups and by the early 1990s the only segment open was 2 miles of trail through Petoskey's Bay Front Park. The turning point came in 1995 when the various trail advocate groups reorganized themselves into the Top of Michigan Trails Council. Within seven years most of the trail from Charlevoix to Petoskey was built. By 2009 the 1.4-mile "Resort Bluffs" segment between East Park and Magnus Park was completed along with the segment from Little Traverse Township Park to the northern trailhead on the east side of Harbor Springs. Officially the trail is 23.25 miles but local connecting sidewalks and bike routes link it to downtown Charlevoix and downtown Harbor Springs for a total of 26.65 miles. The Wheelway is surfaced with 8’ to 10’ wide asphalt or 6’ wide concrete sidewalk and is open for non-motorized use only. From the southern trailhead you can go into the city of Charlevoix by following Waller Road west and McSauba Road east to Division Road. This 2.5-mile in-town trail passes close to the North Point Nature Preserve and Mount McSauba Recreation Area overlooking the bay. The Wheelway is a marked bicycle lane along Waller Road until it reaches US-31. At this point it becomes a separate, 10-foot-wide trail that follows US-31. It’s surprising how little of the state highway you see as the trail dips back and forth into woodlots and small tracts of forest. Within a mile you reach one of the most interesting sections of the Wheelway. Here the paved path becomes a boardwalk that extends 0.6 mile through a wetland. From the boardwalk the trail continues for another mile and then reaches Lake Michigan for the first time where it passes through Adams Rest Area, a MDOT roadside park designed for both vehicles and bicycles rerached at Mile 3. For the next 3 miles there is almost a continuous view of the shoreline. At times the trail is so close to the water boulders have piled up to protect it during storms. This is one of the most incredible stretches of bicycle path in Michigan, an asphalt ribbon that winds pass beaches, roadside parks, panoramic views of Little Traverse Bay and Loeb Nature Preserve. Just beyond the two-acre preserve the Wheelway makes it's longest climb of the day to the top of a railway overpass and then descends towards the entrance drive to West Park, reached at Mile 7.3. The next 5.5 miles is away from the shoreline as the Wheelway skirts Bay Harbor Resort and its 27-hole golf course, partly along the former rail corridor. This segment offers spectacular views of Little Traverse Bay and includes a 50-foot-long tunnel. You can easily detour into the Village at Bay Harbor to for food, drink or shopping. Just beyond Mile 12, you descend to East Park, an excellent intermediate trailhead or a spot for an extended break with its restrooms, picnic shelter and an observation deck perched above Little Traverse Bay. The 1.4-mile segment from East Park to the City of Petoskey’s Magnus Park runs along a magnificent bluff above the bay and is widely regarded as the most scenic on the entire Wheelway. From Magnus Park the trail passes by the Historic Mission Church before it crosses the Bear River at Bayfront Park, reached at Mile 14.4. Parking and facilities are available at Bayfront Park or you can detour into the Gaslight Shopping District of downtown Petoskey via the pedestrian tunnel under US-31. 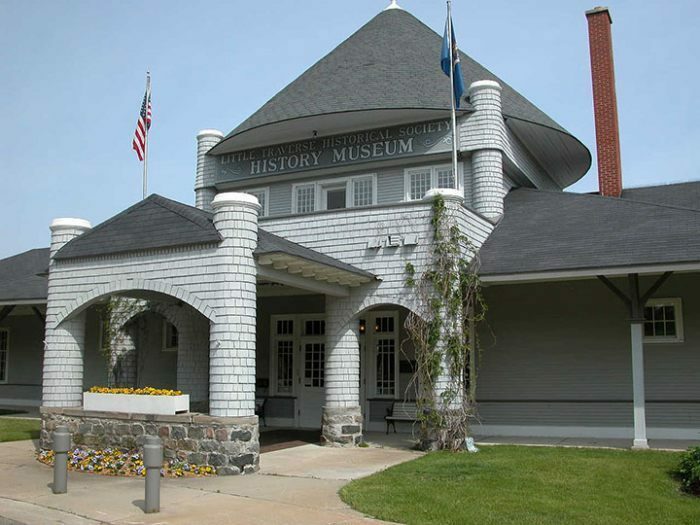 The trail also passes the Little Traverse History Museum located in the impressive Chicago and West Michigan Railroad depot that was built in 1892. The Wheelway exits the park and skirts US-31 to pass through historic Bay View along a salmon-colored sidewalk where one side you can view thew bay and on the other Victorian cottages. The trail then goes back along the railroad line through a residential community before it reaches the edge of the water once again. At Mile 17, just east of the Tannery Creek Condominiums, the Wheelway reaches the Tannery Creek Trailhead that features a painted mural and serves as the "back gate" to Petoskey State Park with its outstanding beach. The Wheelway passes through a young oak and white pine forest to arrive at the Litzenburger Fountain at M-119 (Mile 17.55). Parking is available in Sprig Lake Park across the road along with rest rooms and a picnic area. The North Country Trail leaves the Wheelway in the park and continues north along the Petoskey-Mackinaw City Trail. 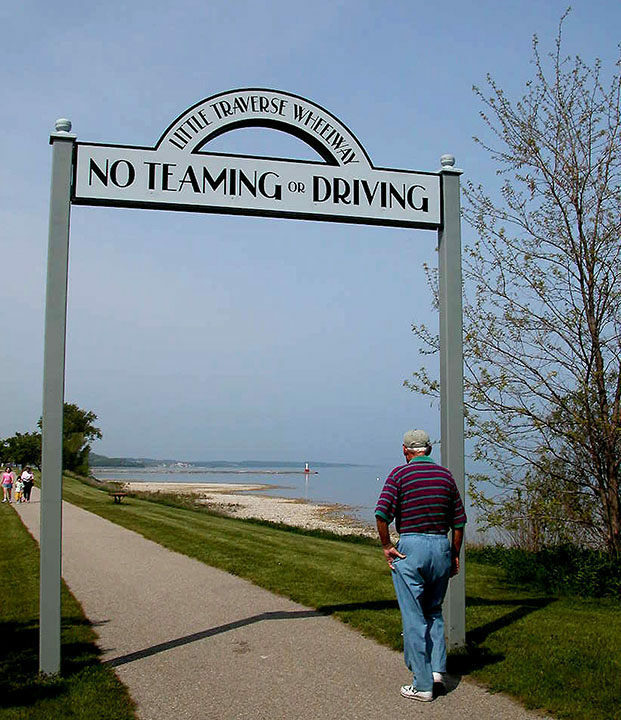 Along M-119, the Wheelway runs along a commercial area and reaches the entrance of Petoskey State Park within a mile. 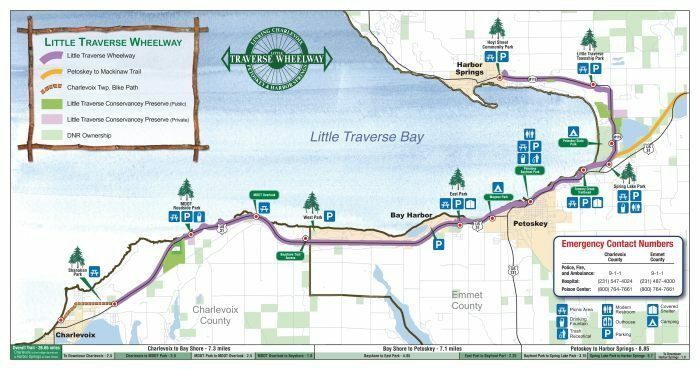 After passing the Harbor Spring Airport the trail arrives at Little Traverse Township Park at Mile 20.3 where there are nice views of the Bay and then crosses M-119. You head into Harbor Springs on the north side of M-119 reaching Hoyt Street Community Park at Mile 23.25. At Charlevoix Township Hall a half mile from US-31 on Waller Road where there is parking and restrooms. There are also restrooms at northern trailhead located in Hoyt Street Community Park. Description of facilities along the trail can be found in the Trail Guide section. The Wheelway is open for non-motorized use year round. There are no fees to use the trail. The southern trailhead of the Little Wheelway is located at the Charlevoix Township Hall a half mile from US-31 on Waller Road. The northern trailhead is near Hoyt and Lake Streets on the east side of Harbor Springs.